We have another new contender to join the online casino world and Crazyno is ready to find its feet in this tough market. Judging by Crazyno’s sister sites, such as Gale & Martin and Ridika, Crazyno already has a fighting chance of thriving and as the name suggests, it promises to be a crazy casino experience. Let’s take a look to see if it is as whacky as its name suggests. To start with, let’s not confuse Crazyno with Cozyno (another online casino site) which google is currently struggling with. Once you find the Crazyno homepage, there is a clear, fun, galactic design with the sites mascot, ‘Nutty Johnson’ there to great you and explain your mission; to help him get back to his home planet. In order to help Nutty, he needs doggy biscuits which will power his doggy ship. Depositing and wagering will fill your bags with the biscuits required and you and Nutty will fly onto the next planet en-route to his home. This is a simple and light-heated theme that has been well executed. It may not appeal to all players and may seem a little childish to some, especially the more serious online casino players, but it helps Crazyno stand out from the crowd and it’s nice to see a little more thought has gone into the design rather than another carbon copy online casino. 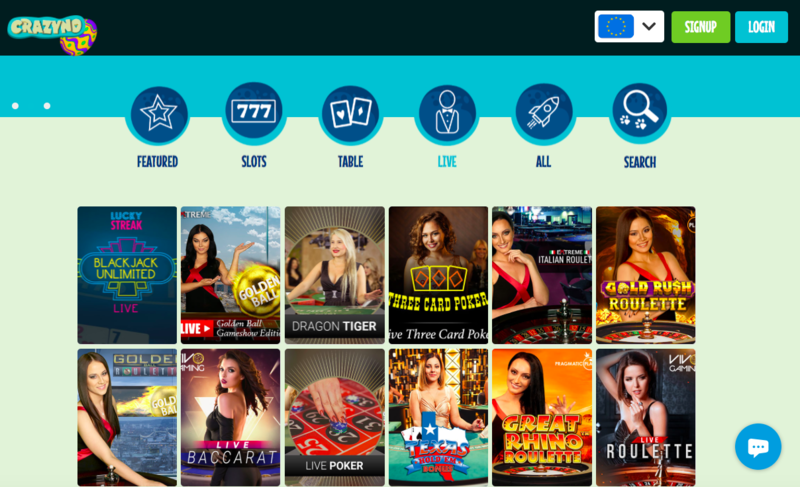 Crazyno has a really nice layout, with a light blue colour scheme, logo and running banners along the top and then clear icons showing slots, table games, live casino, all games and featured games that you can be taken directly to. It’s fair to say, it’s a very user friendly site and doesn’t feel intimidating at all. At Crazyno, you can play slots, live casino games, card and table games and special featured games. There is a decent selection available and most players will find something appealing to them. Games are powered by the likes of NextGen, Betsoft, Yggdrasil to name a few, so there’s a good calibre of developers behind the site. As well as a generous welcome bonus (check the site for the latest offers and promotions) there are a whole host of bonuses and promotions for both new and existing players which is great to see as many sites tend to focus on bringing in new players rather than looking after regular players. There is a VIP scheme available for regular depositors and a good selection of languages available including, English, Spanish, Swedish, French etc. There is live chat available to assist with any queries and plenty of deposit methods to credit your account including: visa, mastercard, maestro, skrill, Neteller and EcoPayz. As with most online casino’s be prepared to provide identification before depositing or withdrawing. So overall, Crazyno has really made an effort in its design and overall feel. It’s not ground-breaking, as there has been other sites which have a story to follow and missions to complete. The main character, Nutty Johnson, may also cause some issues with the UK compliance regulations too as it verges on being child friendly, but that aside, it’s a great looking site. There’s a great selection of games from big name developers and plenty of promotions to retain players, so this will appeal to new and experienced players. 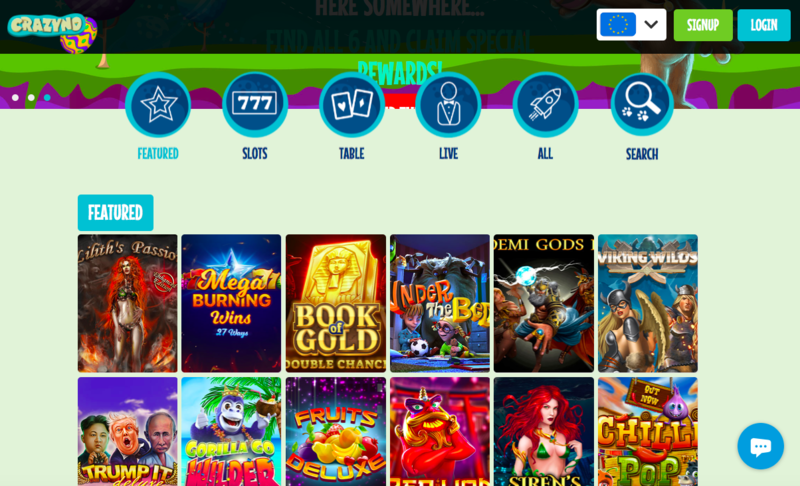 Crazyno, although not completely crazy and wild, does inject a lot of fun into the online casino market, so it’s well worth a visit if you’re looking for a brand new site that isn’t a carbon copy of every other casino site.